Lena Gordon Samuelson wants you to fall in love  with your space. That’s why she created D2D Studio. The right space sets the stage for positive interactions, she believes. 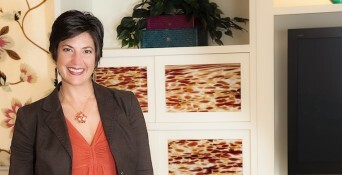 Samuelson shared the secrets of her success with Lesbian.com. I own and operate a boutique interior design firm. We provide full service consultation and project management for residential and commercial projects. D2D’s experience includes kitchen and bath remodels, residential architectural detailing, office redesigns, retail space overhauls and subterranean spruce-ups. I truly believe in the psychology of our environment. People are happier, more productive and efficient when their spaces work for them. I love to find ways to make retail stores sell more, families spend more time together and for my clients to love coming home. Did you have another career/other careers before you started your business? It took me the years when most people are in college to decide what I wanted to do. Then I spent the next seven years in school part time. The 11 years before I graduated were filled with many interesting jobs that have given me a well-rounded knowledge base. I arranged flowers, was a property management assistant, worked in a number of law firms as an administrative assistant, scanned microfiche for a cemetery, managed change orders for a custom home builder, was outside sales for a construction company selling kitchens and then started as an admin assistant for a National Dialysis Provider and ended up as the executive assistant to the CEO of the $4 billion company. I took a huge pay cut for my first design gig. What obstacles did you face in establishing your company and how did you overcome them? I didn’t start from scratch. I built a design firm out of what was a real estate staging firm. A student of mine asked me to help her with a project or two, and a year and half later, we had built a firm. She decided to pursue other goals and sold me the company. This was in August 2010. So my biggest obstacle was the economy. I learned to make miracles happen with extremely tight budgets. What’s the single most important piece of advice you received when first starting your company? What aspect of business ownership came as the biggest surprise to you? I am surprised by how stressed situations make me. If I have a difficult client, I barely sleep for weeks. I used to completely forget work once I left. Now, my clients and projects are a constant movie projecting in my head. The flexibility that comes with being my own boss. I structure my hours for my own comfort and happiness. I do often end up agreeing to meet with clients during the evenings and weekends, but I make up for it with an occasional movie in the middle of the day. Do you use social media to engage your customers? If so, does it play a key role in your marketing efforts? I use Facebook and Pinterest. I have engaged an SEO expert, so I sure hope it’s playing a key role. What resources would you recommend to someone who is contemplating starting her own business? I recommend reading articles about how successful business owners started. Attend networking events. Read books about business in general and your industry. Hire a great team to design your website, logo, etc. Gain and keep confidence. Don’t take failures personally or too seriously. There is risk in every success. What would you say is the single most important key to sustaining a business long term? Maintain a life-work balance. Be responsible with your money. Is there anything we didn’t ask you about that you’d like to share with our readers? I was so scared when I first started. I wondered if I would ever get new clients. I wondered how I would survive if new projects stopped coming. I fought through the fear and trusted my instinct to focus on doing a good job and making my clients happy. Somehow, I’ve managed to thrive and grow. I hired my first official employee last July. Samuelson is offering a 35 percent discount on design services to Lesbian.com readers. Visit D2DStudio.com to contact her. You can visit D2D on Facebook and Twitter. Posted May 29th, 2014 & filed under Money.